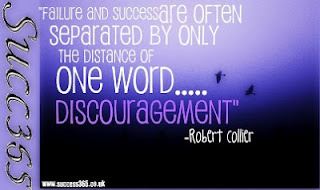 It can be very easy to become discouraged and give up on our pursuit of a goal or desire. In our fast moving world and with our need for everything to be immediate, when our hopes and dreams don't come quickly we let go ever so easily. When we fail to see immediate fruition of any goals we lose focus and move on to something new, only to experience the same results. We have to continue to focus and hold our vision of the desired outcome, not letting go, but sometimes adjusting our course along the way. We have to delay gratification and keep faith with our desires no matter the knocks along the way. Learning from the setbacks and using this feedback to educate ourselves will provide us with the strength and knowledge we require to maintain the ideal once realised.